I've another Etude House x Disney collab for you today! 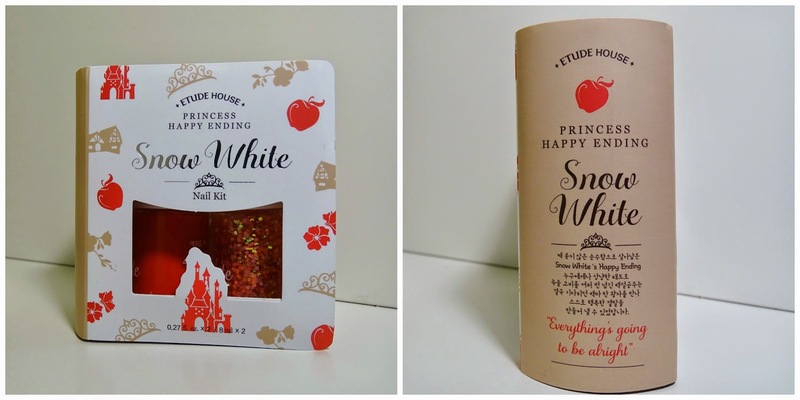 The Princess Happy Ending collection launched sometime in the summer, with products inspired by Snow White, Cinderella, Belle and Jasmine. For me, the biggest draw for this collection were the nail polishes, especially the Snow White one, which is the one I ended up buying. The polishes all have super cute packaging. I absolutely love how the box is made to look like a fairytale book, it is just so adorable! Each set contains two nail polishes and a sheet of nail decals. The Snow White one contained a red polish, a multicoloured glitter polish, and the decals were all shaped like apples and mirrors. The red polish is just standard red polish. It has a nice formula, it applies easily, and it didn't chip for a few days. The glitter in this set is so pretty, I don't have one like it in my collection, and the look of this glitter was one of the reasons why I picked Snow White's polish over the others. The decals are another reason why I picked Snow White's set, they're just so cute! I didn't read the instructions properly at first and kept trying to peel them off the sheet (I thought they were stickers), and I somehow managed to accidentally get a mirror decal onto my nail in all the confusion. Things were a lot easier once I actually read the instructions! All you need to do is cut out the decal you want and press it against the nail for a few seconds, then remove the plastic film! Easy peasy! I love these Etude House x Disney collaborations, and I hope they release more collections like this in the (near) future! You can get this kit for around €7/€8 on eBay.